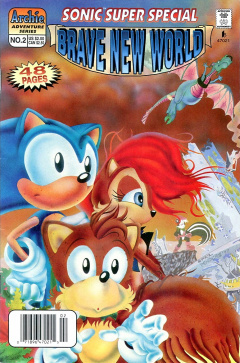 Sonic Super Special, Brave New World is the second Sonic Super Special published by Archie. It includes one story: "Brave New World". Prior to Dr. Robotnik's tyranny, the City of Mobotropolis was a peaceful place full of renowned individuals, including King Maximillian Acorn and his wife. Their daughter, the newly born Sally Acorn, would provide a continuing beacon of hope for the citizens of the great city. Unfortunately, the kingdom fell into war with the Overlanders, and during this war, the Queen disappeared. With help by the defected Overlander Julian, the Kingdom was able to overcome the Overlanders to preserve the Kingdom. It was then that the Warlord Julian revealed his true intentions, changing his name to Dr. Robotnik and banishing the King to the Zone of Silence. With the King out of the way, Robotnik went ahead and roboticized the citizens of the kingdom. Despite the odds against them, those that escaped the city, the Knothole Freedom Fighters, fought against Robotnik and the reformed City of Mobotropolis (renamed Robotropolis). Eventually, though lots of work, the Freedom Fighters prevailed, destroying Robotnik and ending his reign of terror. Now with Robotnik out of the way, and after celebrations, the Freedom Fighters reenter their old kingdom, realizing exactly how much they must do to restore Mobotropolis. All of the denizens of Knothole Village arrive at their old stomping grounds, Robotnik's Robotropolis, to restore their old kingdom. They can't believe exactly how much has changed due to Robotnik's rule, not recognizing a single thing from when they were younger. As they approach the large palace, Rotor wonders how, despite all the missions into Robotropolis, all the changes never affected them on a personal level. Both Geoffrey St. John and Sally agree that the mission comes first, despite the city being their old home. They enter the palace, which is dimly lit, while Bunnie Rabbot jokes that all it needs is some paint to fix it up. The group eventually arrives at Robotnik's large command center, amazed at the area where Robotnik commanded most of his missions and plans. Sally looks at the command chair, noting it is not her father's style, but it will have to do until they can fix everything up. She orders Geoffrey to secure the area, but then Sonic notes that he is feeling ill. Geoffrey asks what is up, as Sonic prepares to say something offensive against Geoffrey. Sally interrupts him before he can, with more important things at hand. Suddenly, a loud creaking sound is heard. Tails and Hershey the Cat hear it, as a large robot, a Dynamac, pops out from a nearby wall and tries to hit Tails. He flies away quickly, while Sonic runs at the robot to attack it. It puts out its hand, deflecting Sonic, along with a projectile from Geoffrey's bow. It then turns its attention to Antoine, Bunnie, Hershey and Tails, as it launches arms out and grabs them. With the four Freedom Fighters in its gasp, the Dynamac starts spinning them uncontrollably. Sally calls out to Sonic, telling him to create a diversion. Sonic gets up from being knocked aside and moving around the robot fast, while it continues to spin the Freedom Fighters. Sonic's movements, however, disorients the Dynamac, causing it to release the Freedom Fighters. Creating multiple images of himself from his speed, the Dynamac is unable to get any hits on Sonic. However, aside, Rotor notices something odd: a curtain entrance nearby. He pulls the curtain aside, revealing Snively, who is controlling the Dynamac. Knowing his ruse is up, he jumps out of the chamber. Sally launches herself at him, but misses, as he dashes for the exit. Geoffrey takes notice of this, aiming his bow and fires at Snively. The arrow turns into a net, which successfully captures him. With the Dynamac now out of control, Sonic continues to distract it while Bunnie grabs a nearby exposed power cord. She pulls it down and connects it with the robot, causing it to electrify and short-circuit. Although Sonic celebrates his victory, Sally is still concerned that there are more surprises awaiting them in Robotropolis. Geoffrey agrees, bringing Snively over in the net, wondering if he could give them any information on other traps. Just like Sally believes, he refuses to cooperate, so Geoffrey leads him out of the command center to confinement. The group dash up a winding staircase to a room that Sally wishes to see. They arrive where she wants to, only to see that it is just a cargo room. Sally sheds a tear, realizing that their home is no more, as she walks over to a boarded up window. Sonic and Tails decide to leave Sally alone for a bit, so they head over to talk to Rotor, who has already started working on the electronics in the palace. Although they have lots of work ahead of them, he believes they can get the city back to what they want it to be. The Freedom Fighters spend their night outside in tents. Sally gets up early, talking with NICOLE to determine a plan of action for the day. They both decide that the Freedom Fighters should split up and get basic necessities running as quickly as possible. Once everybody is up, Sally takes command and orders everybody into groups. She has Antoine and Bunnie head out to get a source of clean water, Rotor to get power running, and Sonic and Tails to scout for any other surprises. They both put on some communicators and head out. She then turns her attention to Geoffrey, but notices that he isn't present with the group. Geoffrey, rather, is in the Robotropolis armory, which is being guarded by his men as well. He opens a communication with Maximillian Acorn, who is now fully conscious and has partial control of his body, though is still bed-ridden in the Knothole hospital. He informs the King that the Robotropolis facilities have been secured and that all threats they have encountered have been those they could anticipate. King Acorn, however, is not pleased, telling him that they must be prepared for the enemy within as well: Sir Charles Hedgehog. He believes Uncle Chuck to be a radical and a threat to their future. Geoffrey isn't so sure, but the King is quite sure of his thoughts, especially since Uncle Chuck was the one who invented the roboticizer and the spy network in Robotropolis that created traitors. Dr. Quack, who is beside the bed, tries to calm the King down, as Geoffrey ends the communication. He leaves the armory, telling his men to continue guarding it while he goes out on a security detail. In his lab, Uncle Chuck packs up some surveillance equipment that he believes to be of no use to him anymore. Though with an uncertain future, he decides to just pack and keep it instead of throwing it out. He then opens a panel nearby, revealing a button. He presses the button, which opens the floor nearby leading to a staircase. He walks down the staircase, leading into a sewer where he is greeted by two roboticized Mobians. They ask why he has come, as a number of other roboticized citizens arrive on the scene, including two other hedgehogs. He informs the group that Robotnik has been defeated, but this good news doesn't come as freedom to the group, still stuck in their robotic bodies. All the Mobians want is to return to their families, in their original forms, but, unfortunately, since the original roboticizer was destroyed, they cannot return to their normal forms. Despite being the original creator of the machine, Uncle Chuck can't guarantee it would work. If there is any minor change from the original roboticizer, the deroboticization process could kill them. One of the Mobians speaks up, a dog, bringing a bright side to the conversation, saying that he's been through worse, and now his joints are better. He agrees that they need to move on, which Uncle Chuck also believes. He turns to Jules Hedgehog and Bernadette Hedgehog, the two roboticized hedgehogs, and asks them for their opinion. They also decide that they need to move on with their lives. Back outside, Tails and Sonic continue to run through Robotropolis looking for any threats. Tails contacts Sonic on his communicator, just as he notices some shadows moving nearby. He flies over and sees a squadron of SWATbots walking into a factory, each carrying a box. Sonic is quick to arrive, while the last of the SWATbots enters the factory. Curious to see what is up, they sneak in and watch the SWATbots work on a conveyor belt from a gangway above the factory floor. Sonic realizes that, despite Robotnik being gone, the SWATbots are continuing to do his work. Suddenly, a SWATbot approaches the two. They prepare to fight, but notice that the SWATbot ignores them, walking by without doing anything. Now even more curious to find out what is going on, Sonic wants to continue to watch, but the two hear a scream for help. The two run down to the factory floor and approach a door, where the yell for help is louder. The door leads to a very dark stairway, so they decide to go down despite the risks. Part of the stairway is broken off due to damage to the city, so Sonic and Tails careful tread their way down to prevent injury. They arrive at the basement, which is full of debris, to see Penelope yelling and waving for Sonic's attention. Beside her is Arlo, who is trapped under a ton of debris. Sonic steps into action, using his fast-moving legs to remove the debris. Unfortunately, there is too much debris, and he can't do anything. The three are clueless as to what to do, not wanting to leave Arlo alone. They then witness the debris holding Arlo down being held up by a mysterious being. They look over to see their old polar bear friend, Rudyard, now roboticized, lifting the debris. Penelope helps Arlo get up, while, from aside, Uncle Chuck and the other roboticized Mobians arrive on the scene. He goes over to Sonic, telling him he told his friends about the good news...including two particular beings. Jules and Bernadette approach Sonic, glad to see him again. He's confused at first, but realizes that his parents are, indeed, still alive. The news, however, angers Sonic. He turns to Uncle Chuck and demands to know why he kept his parents' fate secret from him. Before they can explain, he runs out of the basement in sadness. Bernadette asks Tails to go after him, while Uncle Chuck starts to regret holding back the truth from him. Tails flies out to catch up to him. On the surface, Sally works with Hamlin and Dylan to determine which communication boxes are working around the palace. Although most aren't working, she decides that having a few working is better than none. Hamlin then calls out, as Uncle Chuck with the other roboticized Mobians arrive on location. Sally hugs Uncle Chuck, glad to see that he delivered the news to the others, despite Sonic's sentiments. Bernadette and Jules approach Sally, but she doesn't recognize them. They reintroduce themselves to Sally, and, now with the family back together, she is happy that the roboticized Mobians have returned. Rudyard doesn't agree, as they are not the same people they used to be. He walks away with another Robian, so Uncle Chuck tells Sally that they just need time to adjust. On top of a hillside overlooking Robotropolis, Sonic talks with Tails, angry that, all that time, Uncle Chuck knew his parents were alive. He told him that his parents were a casualty of war, but Tails also agrees with that, as they lost their biological selves. He then asks Sonic what would be different had he been told the truth. Sonic replies by saying that he would know his parents were there supporting him, but Tails refers to Sally and her father. She knew he was still alive, but it didn't make any situation easier. Just like Uncle Chuck, had Sonic knew about his parents, he likely wouldn't have seen them often anyway. He then notes that Uncle Chuck probably kept it secret because he saw what happened to Sally, and, because Uncle Chuck loves him, he did him a favor by not telling him about his parents. This makes Sonic fully realize why Uncle Chuck did what he did, so he asks Tails to take him back to the city. That evening, while the residents of Knothole barbeque some dinner, Sally talks with NICOLE over their situation. She believes Robotropolis to be a loss cause, with more hope in building a whole new city instead of transforming Robotropolis into its former glory. NICOLE doesn't believe she has explored all her options, which Geoffrey agrees with. He arrives and sits down beside Sally, asking if she needs a friend. She does, but notes that, although he'll always be a friend, he cannot be any more than that. Although she feels there is something between the two, her heart belongs to Sonic. He goes to give her a friendly kiss, but is interrupted by Sonic. He dashes forward and slugs Geoffrey in the face, throwing him out of his seat beside Sally. The punch starts another brawl between the two, with Geoffrey getting up and entering the two into a fist fight. Sally calls out to stop them, but they won't listen. The commotion gathers the attention of Tails and Hershey, who arrive on the scene to help. Antoine and Bunnie also notice the fight, so Antoine grabs a fire hose and gives it to Bunnie. They both take it over to the fighting duo and spray them, successfully ending the duel. Sally approaches the two, disappointed at their childish behavior. She orders them to shake hands and end their conflict. They do so, but quietly tell each other than their rivalry is not over. With their fight done, Sally tells everybody to hit the tents and call it a night. In her tent, Sally uses NICOLE to contact her father. She feels it would be better for everybody to know that her father was actually in command, but he confides with her, telling her she is doing a good job. He then orders her not to tell anybody that he is actually in command, including her friends. She asks why, but he isn't inclined to tell her, ending the communication. With NICOLE still out, she talks to it, telling her it isn't right that she must keep a secret. NICOLE, however, reminds her of the secret she holds from her friends of her previous contact with Knuckles while she was younger. It is simply the burden of command. With those words, Sally closes NICOLE and goes to sleep. The next morning, Sally arrives at the Robotropolis airport, where Uncle Chuck and the other Robians having grouped together. Rudyard tells the princess that their group had done a vote and believe that it is for the best that they start their own colony away from Robotropolis. Sally is more than happy to allow the Robians to stay, but they don't believe they are welcome, as they heard whispers from the Mobians against their kind. Sally is shocked to hear this, but wishes for them to stay, as they are their parents, family and friends. Despite this, the group still disagree. On the other side of the airport, Rotor works to get the main computer on-line. Once he does so, he contacts a plane waiting outside, giving them the all-clear to depart. The do so, leaving the city for the Devil's Gulag. They eventually arrive at the large prison on the mountain. Geoffrey and his men depart the plane and walk down the line of cells, one of which holds Sleuth Dawg, doing their weekly check-up to ensure they have food and water. They pass by another cell, holding Snively. He looks out the window of his cell, preparing for the day when he will strike. Queen Alicia Acorn, Sally Acorn's mother, is shown for the first time in a flashback. Bernadette Hedgehog and Jules Hedgehog are shown, in person, for the first time, the parents of Sonic the Hedgehog. Snively hiding behind a curtain controlling the Dynamac references Oz from The Wizard of Oz. The relationship between Antoine and Bunnie becomes more apparent in this issue. They are shown working together quite often, sleeping in the same tent, and are shown holding hands before the Robians leave Robotropolis. This page was last edited on 28 March 2019, at 17:31.